Seattle real estate guide to gracious living. Unique, modern and vintage homes for sale in Seattle. Beautiful gardens, interior design, Seattle architecture. Search all Seattle homes and real estate for sale. Seattle Neighborhoods, a photo by kmcclaine on Flickr. Isn't this poster neat? It displays all the major- and some of the smaller- Seattle neighborhoods. 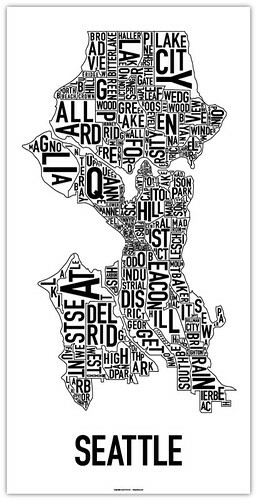 My plan is to hang this up in my room so that I can get a better idea of where different businesses and friend's homes are in Seattle. Being aware of the layout of one's city is just the beginning in truly appreciating Seattle! Are you looking for information about the Seattle neighborhoods? I have a guide to Seattle Neighborhoods and also you can view Seattle homes for sale at Seattle Dream Homes. Take a look and let me know if you have any questions. I'm from Seattle, went to Seattle Public Schools and graduated from Seattle University! I am now one of the best Seattle Real Estate agents (actually, I'm legally a broker) so I can help you if you're buying or selling a home in the Seattle area, just give me a call. My number is 206-329-3795 or email me at Marlow@SeattleDreamHomes.com. Looking for a new home in Seattle? Roots of Style: Do You Live in a Minimalist Traditional House? Kitchen designs, bathroom designs, and more ∨ Browse bedroom ideas, from loft beds to a decorative duvet cover, and dream in style. Work with a home decorator when choosing area rug designs or hanging a new window blind in your home. Forage for your own food in the Pacific Northwest! Need a Realtor? Please allow me to be of service! Do you have some questions? Please don't hesitate to ask! If I don't know the answer, I'll find someone who does! My direct line is 206-329-3795 and I'm delighted to be of assistance!